Performance at Full Circle 2013. Matheny’s Arts Access Program has received a $10,000 grant for Arts Engagement in American Communities from the National Endowment for the Arts (NEA). The grant will support Full Circle, the Arts Access Program’s annual celebration, which will be held this year on Saturday, November 7. 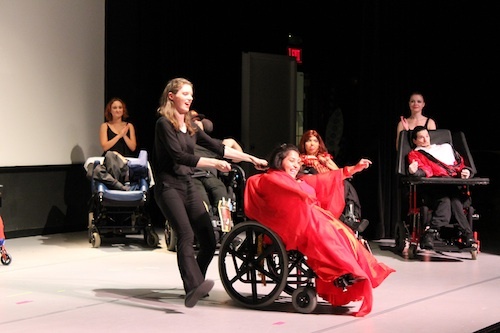 Arts Access empowers individuals with disabilities to create art without boundaries. Through the use of innovative systems and techniques, they can participate in the visual, performing and literary arts. Regardless of their disability, the artists are provided with the tools and materials needed to produce complete pieces of work. Full Circle includes an exhibition displaying original artwork created by artists with disabilities, and guest artists help them create a culminating multimedia performance piece. This entry was posted in Uncategorized and tagged Arts Acces Program, Eileen Murray, Full Circle. Bookmark the permalink.